Bell peppers!!!! There are many few people who really understand the benefits of bell peppers. Those bright colors, green, yellow, red makes them so attractive that i cant withhold myself from buying them. Initially i use to hate bell peppers but now after knowing it’s benefits i have started loving them and enjoy its taste as well. Bell pepper’s bright colors signifies that its rich in vitamins. Bell peppers are richest in Vitamin A and C. 100gms of bell peppers meets the daily requirements of Vitamin A and C. Its not all, it has many other health benefits. Vitamin A helps to improve eyesight. It contains falvonoids which protects our body from oxidative damage and diseased conditions and thereby improves body’s immunity. Vitamin C is in high concentration in red bell peppers. It is water soluble antioxidants and also fight against the infectious agents and thereby keeps body immune. Bell Peppers are also rich in all B vitamins. It is also rich in vitamin E which makes your skin glow and give you healthy hair. Bell peppers help in preventing cancers, specially breast cancers because of it’s high sulphur content. It is a very low calorie vegetable. They have very rich in fiber, a great option for dieters because it also helps in burning of fats. 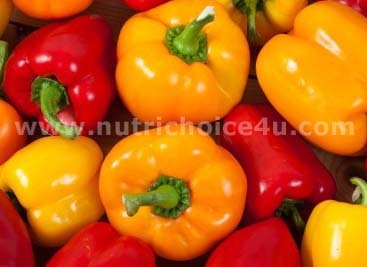 Bell peppers are very effective for arthritis patients. It gives relief if taken for minimum 3months at regular basis. Recommended 100gms/day. I am sure the next time you see bell peppers in market you will surely grab few dozen and have then to fill up your body with nutrients and treat your body. Bell peppers should be slightly cooked to enjoy its real flavor and taste. So roasted bell peppers and sauted bell peppers with salt and jeera dressings tastes yummy. Health Benefits Of Jaggery. Health Benefits Of Potatoes. Health Benefits of Honey.